Welcome to the greatest club on the planet you lucky fellow. Took us less than 30 seconds to select him. The best ruckman in the draft, at pick 19, that's not too shabby. Here's hoping for a long and successful career. Last edited by bulldogtragic; 25-11-2016 at 09:05 PM. a player type we need and fills a very important position on our list but most importantly a very good footballer. Welcome to the dogs Tim. Welcome to the Dogs Tim English. Welcome Tim. Happy with this pick. Seems to use the ball well for a big man. Also looks to cover ground - engine wise. Runs and bounces ridiculously well for a ruckman, seems also to compete well for the ball on the ground - Ben Hudson style. .... Just hope he's not homesick for Perth like a couple of other WA boys we've had recently! However, continues a strong tradition of our club recruiting WA players. I like the look of him in that clip. 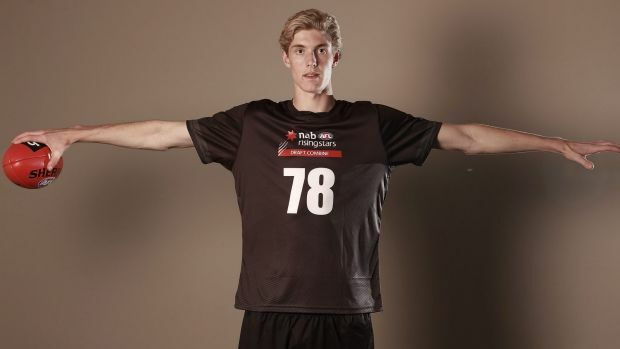 Moves really well for a 203cm ruckman. Really love the kicking action and the quick thinking. Concerned that six years have to go by before we can expect to learn whether he will cut the mustard in all likelihood. Like Webby has said, a few years ago someone like this would be easily top ten credentialed. Congrats Tim; I didn't want to pick you because you're really skinny but now you're ours so obviously you're the biggest steal in the draft. Dal strikes again. I've seen a few fearful references away from here about his need for development and similarities with Ayce Cordy. Something to keep in mind is he's 12kg heavier, albeit 3cm taller than Ayce was when he was drafted. By the time Ayce was playing senior footy moderately regularly he was 20kg than when he was drafted, just 8kg heavier than English is now. I don't know much about English, what I do know is he's not Ayce Cordy in terms of physique. Is it just me, or does he resemble the early 1980's blonde David Bowie. The Thin White Ruck.